The Board of Control for Cricket in India, the BCCI, wishes to run a Champions League featuring Twenty20 sides from around the world. The BCCI backs the IPL Twenty20 league and says sides featuring players from the rival ICL can’t appear in its Champions League. Various county cricketers have played in the ICL, so the England and Wales Cricket Board, the ECB, is unhappy. They’re also unhappy because the BCCI want half the money from this Champions League. The BCCI are sick of the ECB now and have told them to piss off. The ECB have said, ‘fine, we’ll go – but we’re starting our own Champions League and it’s going to be better than yours’. The BCCI said: ‘Do it. We’ll see whose is best,’ and then they’ve each taken it in turns to say ‘fine’ as the ECB have stormed out of the building in a huff. The question is, have the ECB irritated the BCCI so much that the BCCI will crush the ECB’s Champions League or have the ECB pissed off the BCCI so royally that the BCCI will crush the ECB’s Champions League and the EPL and whatever else takes their fancy. Because they can. India brings in three quarters of the money in the game and that fact wins pretty much every argument. In a way it’d be best if there were two Champions Leagues, because then they’d both fit the Champions League template, which of course dictates that there should be as few champion teams as possible. Champions leagues should really be stocked with ‘big’ teams who owe their status to repeated appearances in the Champions League, not sides who’ve ever actually won anything. Most casual cricket fans (the type that Twenty20 is meant to appeal to) will be as confused as an England selector by all of these competitions. Can’t anyone organise anything without the BCCI wanting half the proceeds? It’s not as if they own the rights to Twenty20 – they didn’t even come up with the idea. I had some mates round for dinner the other day. Lalit Modi rang up and told me that my mates would only turn up if he had half the food, half the wine and half of the packet of Pringles that people nibbled on beforehand. It was so annoying. You can’t organise anything these days without the BCCI wanting their slice of the cake. Literally. I don’t like Twenty20 anymore. By the end of finals day I was quite glad the slogfest was all over. 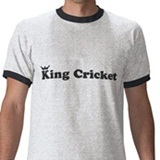 As far as I’m concerned the BCCI are welcome to the bloody lot…….and I hope it chokes them. You were lucky, D Charlton. We arranged for people to come round for food, only for the BCCI to schedule their own dinner soiree for the exact same night. They made theirs sound really good and no-one came to ours. They booked in better dancing girls, didnâ€™t they! Love the photo of Lalit – oh, sorry, KC, have I blown your attempt at subtle innuendo? Nope. We genuinely just felt that we ought to inject at least one element of fun in an otherwise turgid, workmanlike update. We really, really do like monkeys, you know. He looks indifferent, that monkey. Conspicuously, so. Is there cricket nearby? Yes, there’s cricket nearby, but he’s not indifferent. He’s ATTENTIVE. It’s a seemingly uneventful passage of play, but our friend is paying close attention because he appreciates the finer complexities of the game. Lemurs. Lemurs are infinitely superior to monkeys. We have a friend who claims that once upon a time on Madagascar there were ‘lemurs much like man’. They have never once backed this story up with any further information. I once met a lemur who was much like Graeme Smith. At Dartmoor Zoo, though, not in Madagascar. Are you sure they didn’t have it the wrong way around? The next meeting involving the ECB and the BCCI should be interesting. Something involving the ECB saying “Look, it’s our game, we invented the sport and we’ve decided that you’re not playing any more, it’s our ball and we’re going home”, I hope. Isn’t it fun when grown men act like school children? SimonC, it’s all in the eyes. They can’t feign innocence. Dave, yes. It’s very, very fun indeed. Particularly when they’re wearing suits. In the wild Lemurs are far too slim to be mistaken for any of the South African team – zoos are bad, and give fat animals a bad name! In enclosed spaces I have seen Lemurs bounce off the ceiling – perhaps Gunter is the alter-ego of Lemurs too? Have you noticed that Macaques are always indifferent to cricket? Langurs are much more refined! Though 50% may sound strange but if a boards country will generate 90% of revenue of that competition whats the problem with other boards?? want a bigger pie of other peoples money?